What do you do with an old salt mine? Turn it into a huge battery of course. We're all familiar with lithium-ion batteries like those in our phones, but on a utility scale, they are simply impractical. 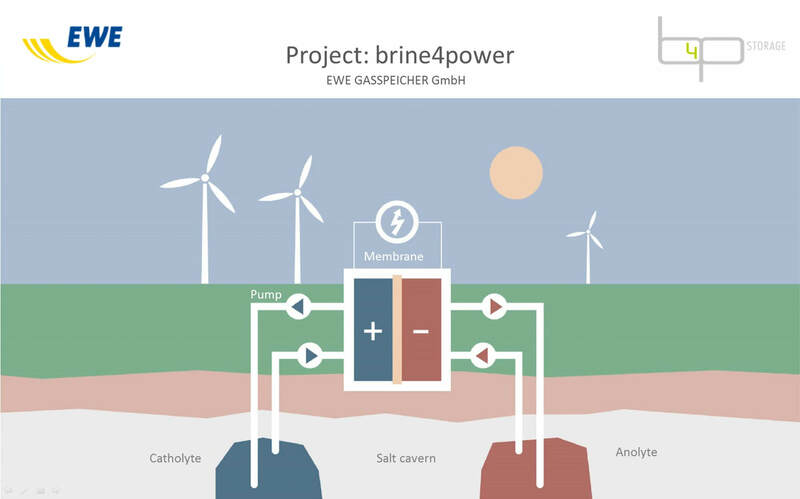 German company Ewe Gasspeicher GmbH has announced plans to build what could be called the world's biggest battery. The system, dubbed "brine4power" will be housed in huge underground salt caverns that were previously used as a natural gas storage facility. They each have a volume of 3.5 million cubic feet and will give the battery a capacity of up to 700MWh at an output of 120MW. If you want energy storage on the scale of an electrical grid, there are currently two main options. The first and most common is pumped storage. It works like a standard hydroelectric power plant but in reverse. Pumps move vast amounts of water uphill to a holding pond thus storing energy in the form of gravitational potential energy. When you want to "discharge" the battery, you simply let the water run downhill and run the hydroelectric plant like normal. The other main technology, and the one planned for the German project, is called a redox flow battery. It works by storing energy in the form of liquid electrolytes. There is a positive catholyte and a negative anolyte which are separated by a membrane that only allows ions to pass through. When charging, the ions move to the anolyte side and when discharging, they move back. This process takes up about 100 times the space per unit of energy compared to a lithium ion battery, but is much more environmentally friendly. Rather than storing the electricity in another form like pumped storage does, the brine4power system stores it directly in the liquid. The system can theoretically supply a day's worth of power to about 75,000 homes. In other news, Elon Musk recently announced Tesla's plan to build the world's largest lithium-ion battery in Australia. Representing its true scale, this redox flow battery will be more than 5 times larger.